Amazon Fire TV is a digital media player and its microconsole remote developed by Amazon. The device is a small network appliance that can deliver digital audio/video content streamed via the internet, to a high-definition television. It also allows users to play video games with the included remote, via a mobile app, or with an optional game controller. The device comes in two form factors: Fire TV, a set top box, and Fire TV Stick a cut-down version presented as an HDMI plug-in stick. The first-generation Fire TV device featured 2 GB of RAM, MIMO dual-band Wi-Fi, and a Bluetooth remote control with a microphone for voice search. It supported 1080p streaming and Dolby Digital Plus 7.1 surround sound but was dependent on internet bandwidth of the user. Unveiled on April 2, 2014, the Amazon Fire TV (1st Generation) was made available for purchase in the US the same day for US$99 and was launched with a video game called Sev Zero. In 2015, the Amazon Fire TV (2nd Generation) was released with improved processor speed and 4K UHD support. Amazon Fire TV is also available in the United Kingdom, Germany, Japan and launched in India in 2016. In September 2018, Amazon announced the Fire TV Recast, a digital video recorder which works with a HD antenna to record shows for later viewing on a Fire TV or Echo Show device. It is designed for use with over-the-air TV services and is a part of the cord-cutting movement. In October 2018, Amazon announced the latest Fire TV Stick which offers 4K UHD for $50. It is designed as an affordable device with the 4K UHD playback that higher-end Fire TV devices have. The first Fire TV (codenamed "Bueller" after the eponymous character from Ferris Bueller's Day Off) offers HDMI audio, with support for Dolby Digital Plus and 7.1 surround sound pass-through, along with an Ethernet port and a USB 2.0 port. According to Amazon, the Fire TV is designed to outpace competitors like the Apple TV and Roku in performance: The 0.72-inch-thick box features a 1.7 GHz quad-core CPU (Qualcomm Snapdragon 8064), 2 GB of RAM and 8 GB of internal storage, along with a dual-band wireless radio for 1080p streaming over 802.11a/b/g/n Wi-Fi and a 10/100 ethernet connection. The company said that it does not intend the Fire TV to compete with gaming consoles; instead, its gaming capabilities are geared toward people who do not already own a console but may play games on a smartphone or tablet. It has a dedicated controller accessory. Amazon released a 2nd-generation Fire TV, codenamed "Sloane", in late 2015. The 2nd generation now features 4K Ultra High Definition support, improved processor performance, and a MediaTek 8173C chipset to support H.265 (HEVC), VP8, and VP9 codecs. Wireless hardware upgrades includes a dual-band 802.11a/b/g/n/ac Wi-Fi with 2x2 MIMO and Bluetooth 4.1. On September 27, 2017, Amazon announced the third generation Fire TV alongside five other new Amazon products. On October 3, 2018, Amazon announced discontinuing Fire TV in favor of Fire TV Stick. On November 19, 2014, Amazon released a smaller version of the Fire TV called the Fire TV Stick. 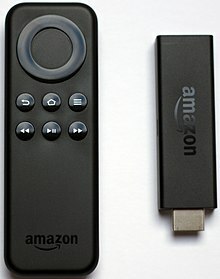 Codenamed "Montoya", it is an HDMI-port plug-in device that replicates much of the functionality of the larger Fire TV. Its hardware is slightly different, it has 1 GB of RAM, 8 GB of internal storage, weighs 0.9 oz. (25.1 g) and it uses a Broadcom BCM28155 dual-core 1.0 GHz Cortex-A9 processor and a Broadcom VideoCore IV GPU. Wireless hardware includes a dual-band 802.11 a/b/g/n Wi-Fi with 2x2 MIMO and Bluetooth 3.0  The Fire TV Stick is bundled with a remote control, in either of two variants; one with voice search on the remote and one without. On October 20, 2016, Amazon released Fire TV Stick with Alexa Voice Remote, codenamed "Tank". Other than the new remote, the updates include MediaTek MT8127D Quad-core ARM 1.3 GHz processor with a Mali-450 MP4 GPU, and support for the H.265 (HEVC) codec. Wireless hardware upgrades includes a dual-band 802.11a/b/g/n/ac Wi-Fi with 2x2 MIMO and Bluetooth 4.1. It retains the 1GB of RAM and 8GB of storage and weighs slightly more at 1.1 oz. (32.0 g). Amazon later re-released the second generation Fire TV Stick with the all-new Alexa Voice Remote from the third generation Fire TV Stick 4K. On October 3, 2018, Amazon announced the Fire TV Stick 4K with all-new Alexa Voice Remote. Included for the first time are buttons for volume, power, and mute. Amazon scheduled the release date for October 31, 2018, which will also introduce the new remote control as a standalone product. The Fire TV Stick 4K delivers Ultra HD and HDR streaming through an HDMI dongle that costs $50. It is the first media stick to support Dolby Atmos, Dolby Vision and HDR10+ that promises higher video and audio quality to compatible audio systems and TVs. The device also syncs with Amazon's Alexa Voice Remote with features like Bluetooth, "multi-directional" infrared and buttons for power, volume and muting. Amazon announced that in-app Alexa control will be featured in more specialized video service, such as AMC, HBO Now, A&E, VH1 and Sony Crackle, among others. For undisclosed reasons, the screen mirroring functionality which was unavailable during release was restored through an OS update (OS 6.2.6.3) early April 2019 . The Fire TV Stick 4K also has a 1.7GHz processor, faster than the 2017 Fire TV, and a 4K streamer with dangling "pendant" designs. Amazon predicts smoother response times and faster loading in this edition. Germany, India and the UK were to release the Fire TV Stick 4K on November 14 and Japan to receive it by the end of 2018. The Fire TV Cube was launched in June 2018, as a mix of the Fire TV and Echo Dot. The device uses a 1.5 GHz quad-core ARM 4xCA53 processor, 2 GB RAM, and 16 GB storage. The device initially ran Fire OS 3.0, based on Android Jelly Bean 4.2. According to Amazon, that made it "simple for developers to port their services and games over to Fire TV." In November 2017, Amazon launched the Fire TV version of the Amazon Silk web browser. In December 2017, Mozilla launched a Fire TV version of the Mozilla Firefox browser. 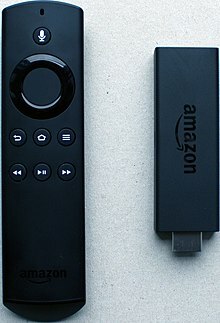 Expandable USB storage on Amazon Fire TV; the user can connect a USB mass storage device to expand the Fire TV storage. Connect to the user's hotel or dorm room Wi-Fi with captive portal support, which enables the user to connect to Wi-Fi that requires web authentication—this includes Wi-Fi at most major hotels, as well as some universities. Private listening on Fire TV, adds support for wireless Bluetooth headphones to Fire TV. Browse and search Prime Playlists: Prime members can now take advantage of Prime Music playlists from Fire TV with hundreds of expertly curated Prime Playlists to pick from. Hidden PIN entry, the PIN entry screen hides the numbers selected. New shortcuts put the user's Fire TV to sleep or enable display mirroring by pressing and holding the Home button on the remote. 4.5" x 4.5" x 0.7"
3.4" x 1.2" x 0.5"
Dan Seifert from The Verge reviewed Fire TV on April 4, 2014, giving it an 8.8/10 rating and largely praising its functionality and future potential. Dave Smith from ReadWrite wrote, "Fire TV aims to be the cure for what ails TV set-top boxes." GeekWire editor Andy Liu's review is headlined "Amazon's Fire TV sets a new bar for streaming boxes. "Ars Technica praised the device for specifications that surpassed competitors, good build quality, and a microphone works very well if you use Amazon content. However, the reviewer disliked the fact that its media browser puts Amazon content in the front, which makes other applications less convenient to use, limited game selection with many games not optimized, and only 5.16GB of free space, which limits the number of games that can be installed. ^ a b "Amazon Fire TV now available for pre-order in the UK and Germany". ^ "Amazon Fire TV & Fire TV Stick Coming to Japan". Archived from the original on 2016-02-06. Retrieved 2016-01-26. ^ a b Horn, Leslie (April 2, 2014). "Fire TV: Everything You Need to Know About Amazon's $100 Streaming Box". Gizmodo. Gawker Media. Retrieved April 2, 2014. ^ a b c "Publish to Fire OS 5". Amazon.com. Retrieved July 24, 2016. ^ a b c d e f g h i j k "Amazon Fire TV –Streaming Media Player –Shop Now". Amazon.com. Retrieved April 12, 2003. ^ James, Dave. "Amazon Fire TV review". techradar. Retrieved 25 Jul 2016. ^ Solomon, Kate. "Amazon Fire TV is Amazon's powerful new streaming box". Techradar.com. Retrieved April 2, 2014. ^ Tam, Donna. "Amazon unveils Amazon Fire TV for streaming video". CNET. Retrieved April 2, 2014. ^ James, Dave. "Amazon Fire TV review". techradar. Retrieved 17 May 2016. ^ "Amazon Fire Stick launched in India: Detailed review 2017". Finissue. 2017-08-27. Retrieved 2017-09-22. ^ Goode, Lauren; Calore, Michael (20 September 2018). "Is there an Echo in here? Everything Amazon announced". Wired. Retrieved 21 September 2018. ^ "Amazon Fire TV Recast: The new cord cutting DVR explained". Trusted Reviews. 2018-09-24. Retrieved 2018-09-24. ^ "Amazon's latest Fire TV Stick offers 4K for $50". Engadget. Retrieved 2018-10-19. ^ a b c d e "The Amazon Fire TV Stick 2's codename is Tank". AFTVNews. ^ "Amazon's Fire TV Piles Into the Living Room". Businessweek. 2014-04-02. Retrieved 2014-04-17. ^ a b c d "Device Specifications for Fire TV". developer.amazon.com. Retrieved 2018-05-08. ^ a b "The Fire TV Stick 4K fixes Amazon's remote problem". techhive.com. 2018-10-03. Retrieved 2018-10-06. ^ "How Amazon's Fire TV Stick Compares to Other Streaming Dongles - WIRED". WIRED. ^ Fire TV Stick - Official Site. Retrieved 8 July 2015. ^ Estrada, Maren (2016-10-17). "Amazon's next-gen Fire TV Stick with Alexa is only $40, and it launches this week". BGR. Retrieved 2016-10-20. ^ All-New Fire TV Stick with Alexa Voice Remote | Streaming Media Player. ^ Haselton, Todd (21 June 2018). "The Amazon Fire TV Cube is so good I want one for every TV in my house". CNBC. Retrieved 23 June 2018. ^ "Amazon Fire TV Cube specs, UK release date, price and more". Pocket-lint. 2018-06-22. Retrieved 2018-07-16. ^ "Amazon Announces New Features for Amazon Fire TV and Fire TV Stick". Amazon. 2015-03-24. Retrieved 2015-05-27. ^ "Amazon Fire TV Stick Review – A Cord Cutting Solution? - Frugal Rules". Frugal Rules. 2017-06-21. Retrieved 2018-10-19. ^ a b "Amazon Fire TV Device Software Updates". Amazon. Retrieved 2018-05-10. ^ "COMPARATIVE: Mediatek MT8695 Vs all current SoC". AndroidPCtv. 2018-12-12. Retrieved 2019-01-26. ^ "COMPARATIVE: Mediatek MT8695 Vs all current SoC". AndroidPCtv. 2018-12-12. Retrieved 2019-03-19. ^ Seifert, Dan (2014-04-04). "Amazon Fire TV review". The Verge. Retrieved 2014-04-21. ^ "Review: The Amazon Fire TV Is Kind Of A Mess – ReadWrite". ^ Liu, Andy. "Review: Amazon's Fire TV sets a new bar for streaming boxes". GeekWire. Retrieved 2014-04-21. ^ Amazon Fire TV misses the same marks as Ouya, other media boxes. Ars Technica. Retrieved 1 July 2014.